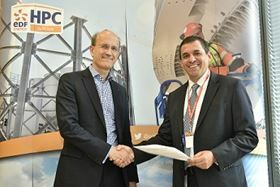 Jose Larios (right), SPX Flow’s president, Industrial and Energy, and Humphrey Cadoux-Hudson (left), EDF Energy’s MD of Nuclear New Build at the recent signing ceremony in London. The 16 ASG and RRI pumps will be delivered via the ClydeUnion Pumps factory in Annecy, France. The ASG (Emergency Feedwater System) supplies the required rate of water to the steam generators secondary side if all the systems contributing to normal supply of the steam generators are unavailable. The RRI (Component Cooling Water System) is designed to cool and transfer heat load from various components and systems of the nuclear island during the different operating conditions of the nuclear plant unit. Custom-built pump systems and through life services for the nuclear industry are supplied by SPX Flow engineers at manufacturing facilities in Annecy, France and Glasgow, UK.